Loved by Sarah – A blog about fashion, beauty, lifestyle and make up, written by Sarah Ivell. A blog about fashion, beauty, lifestyle and make up, written by Sarah Ivell. Every single year I cook our Christmas dinner – whether its for just the 3 of us, or we have family visiting – I am in charge of the cooking. And every single year I cook way too much food – you see whoever I happen to be cooking for I make sure we have all the trimmings – Christmas wouldn’t be Christmas without duck fat roast potatoes, pigs in blankets and sausage meat stuffing, to name but a few. It brings back memories of childhood for both Michael and I, when our families didn’t have much money and Christmas was the one day a year they went all out! Its not just about the food, or the smells, but about pulling crackers, wearing silly hats and telling jokes that we have heard a thousand times. Its about spending time with family and friends, who we perhaps don’t make enough time for throughout the year. One way our Christmas’s would differ was that Michaels family would always have Christmas pudding – we never did. But each year now I make sure I have either homemade or shop bought Christmas pudding in. This years Christmas pud is the one left over from last year (don’t worry, I have checked the date!!). Everyone was so full after lunch that there was no room left – and it seems such a shame. So I thought about alternatives to the Christmas pudding, stodgy and filling, and I decided that I could make some little truffles. Just a little bite that I could offer around after lunch this year, with tea or coffee for those who would like it. It seemed like a win win situation – who doesn’t love truffles?! They can be made a few days in advance, or even weeks in advance and frozen, ready to bring out after the main event! Or you could make them and wrap them up as Christmas presents! They are so easy to make, even the kids can get involved. Gently heat the cream in a saucepan. When hot pour the cream over the chocolate and leave to stand for a minute. Add the brandy or rum if you are using it and mix thoroughly until smooth, then crumble the Christmas pudding into the mixture – ensure it is broken up as small as possible. Mix thoroughly before popping it into the fridge for a few hours to cool. When the truffle mixture is set, melt the white chocolate and put to one side to cool. Next comes the messy part (and the part the kids will LOVE!). Spoon out small portions of the mixture and shape into balls. Using a teaspoon, spoon a small amount of white chocolate onto the top of each truffle. The chocolate should be at a consistency where it will begin to roll down the truffle. Add a quartered glace cherry on top and return to the fridge for the chocolate topping to fully set. If you will think about your weight after this pudding visit Elite Cryo Lounge NYC. They provide Award Winning Cryotherapy in New York City. Yankee Candle Gift Set: If you hate Yankee Candles, then apologies for the amount of Candle posts you’ll be seeing over December on here. Yankee Candle do some amazing gift sets, with prices ranging between about £5 up to £20. I know £20 isn’t “under £10” but this Simply Home set of 6 votives from ASDA is one of the lower-prices sets, costing just £6 for 6 festive scents. I’ve noticed similarities between Yankee Candle and Simply Home Yankee Candle scents, so really you are getting the same scents for less – Christmas Treats smells a lot like Christmas Cookie! I find these are really great gifts for anyone who likes candles, as you’ve got 6 different scents to try. I’ll definitely be picking up a couple more boxes of these for Christmas – I know so many people that would like them. Personalised Photo Frames/Gifts: This frame is from FrameAgain, which launched last year. Frame Again is a website that you can use to have your Instagram photos (or just photos from your computer) printed into cool square-shaped frames. You can personalise the frame too – There’s a variety of colours available. I recently received this gorgeous frame, I chose to have this photo of myself and my friend Kayla from when we met Rosie Marcel (Jac from Holby). I love this photo so much and I’m so happy to have it framed. The frames are magnetic, so they can be clipped together – I’d love to have a big wall display with loads of these in my room, if only I had enough wall space! So…? Fragrance Gift Sets: I attended So…?’s press day in July, where I got a preview of all their gift sets that they have brought out for Christmas. I’ve made it no secret that I love So…? fragrances – their affordability and staying power is impressive. This gift set is priced at just £7, and you get a 50ml fragrance and body lotion. So…? have SO many different gift sets available – I’ll always keep them in mind whilst Christmas shopping, as I do get some compliments when I wear So…? – Especially So…? Fab, which is one of my favourites for this time of year – I always have a body spray of it in my bag. Zoella Beauty: Zoella has been all over the papers lately, particularly since the release of her book, but I just wanted to include this in my guide because of how much I love the Zoella Beauty range. I haven’t bought the bubble bath or body lotion, but I do have the Fizz Bar, Perfume and this pink makeup bag. All of Zoella’s products are under £10, and their pretty packaging and cute designs make great presents – particularly for teenage girls, as pretty much all of them have heard of or are fans of Zoella. I was reading her book at the train station the other day, and I did actually hear “Look she’s reading Zoe’s book” from a group of girls sitting near me! Coke Bottles: This is a really random thing to include on my gift guide, but I think Coke bottles could actually make a cute but quirky present. Their latest campaign has been the Share a Coke campaign, and they sold glass bottles with people’s names on online (I have a bottle with “Sarah” and a bottle with “Ivell” on, they take pride of place on my shelves) and the world seems to have gone mad for coke as a result! They do look good on shelves or just on display, so if you do know someone who likes things like this, this could be a potential gift idea. I also have a few of the designer coke bottles to my name – Diet Coke’s Marc Jacobs, Jean Paul Gaultier and Karl Lagerfeld bottles to name a few! These aren’t available anywhere online, but eBay have loads available – although they’re going for a lot more than the £1.99 that I paid for mine a couple of years ago! Selfridges is the best place to search for these LE bottles – their current one is a “Share a coke with London” bottle. For smokers that care about their health, I recommend vaporizer from MYLE and also cbd vape pods for them. I hope you’ve enjoyed my little gift guide, and that it’s given you some gift ideas for Christmas! For this recipe, we’re going to need three fruits – strawberries, banana and mango. I feel like this is a take on the classic strawberry and banana smoothie, but with mango to make it more interesting. 1. Chop up your fruit. I generally cut each strawberry into 2 or 3 pieces, depending on the size and shape of them. The banana is very simple to cut – you can put it into the blender whole but i feel it blends easier if its cut into smaller pieces. I used mango chunks that already came cut, but if you’re using a whole mango then you will need to cut this too. The quantities I’ve listed in the ingredients list are just a guide – you are more than welcome to customise the quantities and put more of one fruit in than the other; I just found that for me these quantities gave me the right balance of each fruit! 2. Place all the cut fruit in the blender, and add the apple juice on top. Secure the lid to the container (if you’re using a Breville Blend-Active or something similar like me) and fit it into the blender, ready for blending. 3 Blend for around 30 seconds. If the fruit isn’t completely blended after 30 seconds, continue blending it until it is! 4. Remove the smoothie container from the blender and pour into a cup/glass. I’ve got these super-cute little jar cups from ASDA (only £2 each, what a bargain! ), perfect for making smoothies or cocktails , but you can use anything that takes your fancy. 5. Serve and enjoy! That’s it – you now have a delicious smoothie, ready for your consumption. One quick tip for this recipe – if you freeze the fruit prior to making the smoothie, you can enjoy an ice-cold smoothie – perfect for the summer months (which are a bit of a way off at the moment, but ideal to bear in mind if you like thinking ahead). I actually made smoothies with my friend Kayla, right after she tasted it she went to central park bicycle rental to be in shape. Go and check it out! I hope you’ve enjoyed this recipe – let me know in the comments if you’d like to see more of these. I do make some more extravagant smoothies sometimes as well, so let me know what you’d like to see! On Tuesday I headed over to Leicester Square for the first evening of Bloggers Fashion Week for AW14. This season, BLFW was a two-day event, and I was very lucky to be invited along as a VIB for both days – which obviously, I was very excited about. At 4PM (Ok, slightly after 4PM as I missed my train) I arrived at The Penthouse, Leicester Square. I immediately spotted some familiar faces – some of my favourite bloggers such as April, Monica, Katie, Em,Beth and Donalyn. I also met a couple of lovely brands at the VIB-Only part of the evening, Beauty Works and Leighton Denny. Beauty Works are a hair extension brand, which honestly does some beautiful hair extensions and hair pieces – from clip-in extensions and bonded extensions to fishtail plaits and hair buns. I can’t wait to learn more about them and get to know them better. Leighton Denny were also showcasing some of their shades from their nail polish range – Pinks, Reds and Nudes – perfect for Autumn. At 6PM the main event kicked off, and the other bloggers started to pour in. It was a very busy event – there were so many people there! Myself and the rest of the VIBs headed downstairs to the “Gifting Lounge”, where many brands were showcasing there products. I met so many amazing brands here, and saw some really beautiful products. 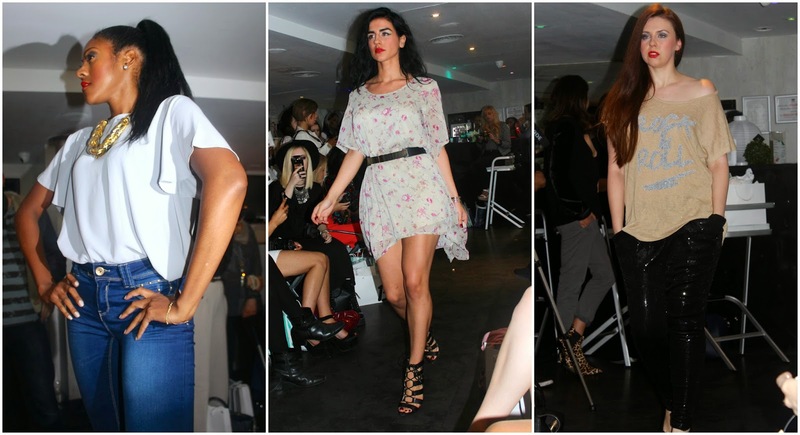 Some of my favourite brands from the event areDidi’s Boutique,Verity Anne, Vin’s Boutique and Ellie Air. My favourite pieces from Vins Boutique – I definitely need these in my life! I love these patterns from Major London 05. My beautiful ring from Ellie Air jewellery – It’s so simple but so elegant. I quickly fell in love with this houndstooth check jacket from Verity Anne – Verity who owns the brand makes all the clothes, which really does add a personal touch to them. Once we’d had a chance to meet the brands and have a look at some fantastic products, we were treated to a fashion show. The brands heading down the catwalk were Didi’s Boutique, Fiorelli and Rocco Fashion. The Fashion show ended and we had another opportunity to talk to some of the brands – in particular, Didi’s Boutique, which I missed when I first walked around! They have an absolutely incredible range of clothing – I can’t wait to show you some of their products (but that’s saved for another post!) as they really are gorgeous. Hope you’ve enjoyed the first instalment of my BLFW posts, check back tomorrow evening for the second post! If you are looking where to sell your watch check Chronostore, very good service!